Henri Drouët (1829–1900) was a French amateur malacologist who, as a civil servant, worked at different places in France and Algeria before settling after his retirement in Dijon. He was in close contact with Arthur Morelet with whom he visited the Azores in 1857. They published jointly on the marine fauna collected there, but Drouët is mainly known as a specialist in freshwater species, especially the Unionidae. 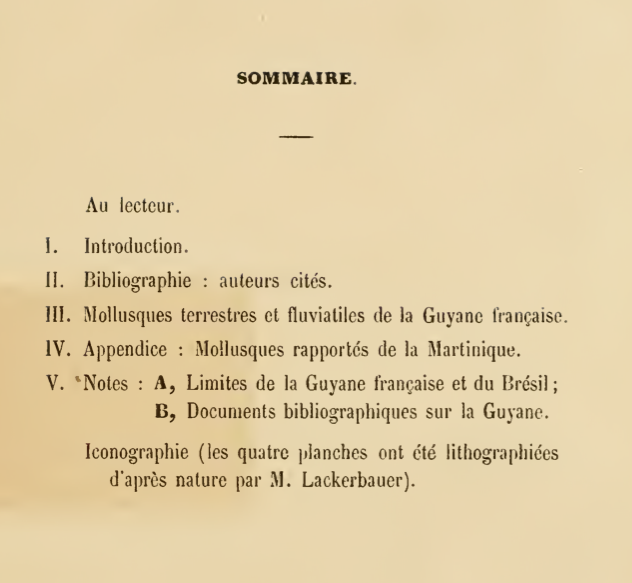 One of his lesser known publications appeared in 1859, entitled ‘Essai sur les mollusques treasures et fluviatile de la Guyana Française’. The table of contents showed that in an appendix also molluscs from the Lesser Antillean island of Martinique were listed. The material that Drouët treated in his ‘Essai’ had been collected by his good friend Charles Eyries, who was a lieutenant in the French Army and stayed from 1852–1856 in French Guiana; he also was for a short time in Martinique. He also received shells from J.P.S. de Grateloup who had been for a while in French Guiana, and from J.C.A. Eudes-Deslongchamps some material collected by the navy surgeon Déplanche. In total Drouët treated 48 terrestrial and 21 freshwater species, of which 10 new to science: Succinea propinqua, Streptaxis deplanchei, Bulimus rufolineatus, B. orthodoxus, B. eyriesii, B. limpidus, Pupa eyriesii, Helicina sericea, Planorbis xerampelinus, and Ampullaria welwitschiana. All are accepted as valid species, except Bulimus orthodoxus, Planorbis xerampelinus and Ampullaria welwitschiana, in the recent book on molluscs from the country by Massemin et al. (2009). In the list of species from Martinique 5 new taxa are described: Cyclophorus liratus, C. acutiliratus, C. cinereus, Helicina pudica, and Ancylus parasitans. In the recent book of Delannoye et al. (2015), none are accepted as valid species. Two taxa are mentioned as nomina inquirenda: Cyclophorus cinereus and Helicina pudica, but by lack of known type material these could not be judged by the authors. I myself also tried to find the type material of Drouët, and to that purpose I went to Dijon back in the 1970s. Visiting the museum in Dijon I could not locate any material. Recently Audibert (2010) located the marine material of Drouët in the collection of the Université de Bourgogne, and part of the terrestrial and fluviatile material turned up in the paleontological collection of E. Marion that is kept in the Dijon museum (Audibert, 2011). No trace, however, of the material from French Guiana and Martinique. While studying the correspondence of the Journal de Conchyliolgie, in the possession of Wim Backhuys, I came across two letters from Drouët to Hippolyte Crosse. 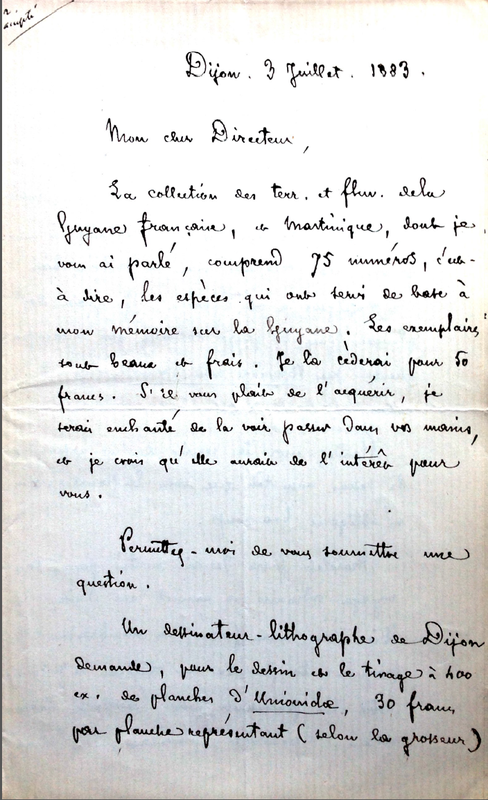 The first is of 3 July 1883, in which he offered him the shells used for his 1859 publication for the price of 50 francs. 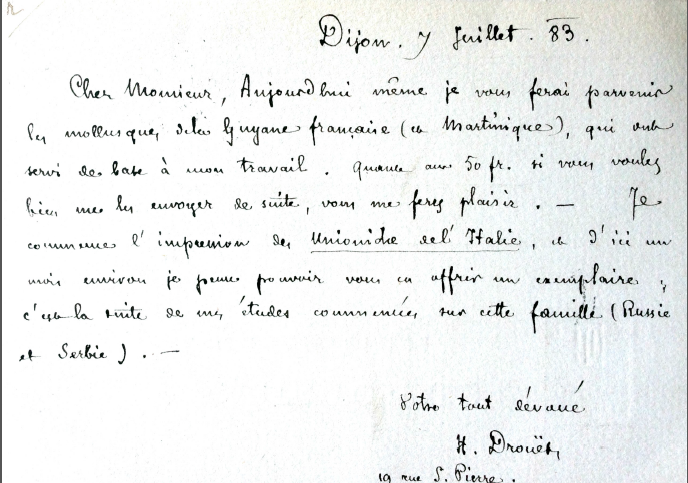 In the left-upper corner of the letter, Crosse wrote “accepté”. On a card dated 7 July, Drouët informed him that he had shipped these shells. After Crosse’s death in 1898, his private collection and library was auctioned by Deyrolle in Paris on 28–30 November 1899 (Deyrolle, 1899). The lot descriptions are, as usual, very superficial, and the Drouët material is not recognizable among them. But no doubt, the material originating from Eyries was dispersed among unknown buyers and has ended up in several unknown collections. The type specimens of the Drouët taxa mentioned above have thus to be considered lost. Audibert, C., 2010. Les collections conchyliologiques de l’Université de Bourgogne. – Folia conchyliologica 3: 5–14. Audibert, C., 2011. Redécouverte de la collection de mollusques continentaux d’Henri Drouët (1829–1900). – Folia conchyliologica 14: 5–9. Delannoye, R., Charles, L., Pointier, J.-P. & Massemin, D., 2015. Mollusques continentaux de la Martinique. Non-marine molluscs of Martinique, Lesser Antilles. Biotope, Mèze/Muséum national d’Histoire naturelle, Paris, 328 pp. Deyrolle, E. (fils), 1899. Catalogue de la bibliothèque et des collections de feu Crosse, directeur du Journal de Conchyliologie. Deyrolle, Paris, 156 pp. Drouët, H., 1859. Essai sur les mollusques terrestres et fluviatiles de la Guyane Française. Baillière, Paris, 116 pp. Massemin, D., Lamy, D., Pointier, J.-P. & Gargominy, O., 2009. Coquillages et escargots de Guyane. Seashells and snails from French Guiana. Biotope, Mèze/Muséum national d’Histoire naturelle, Paris, 456 pp. This entry was posted in Uncategorized and tagged biohistory, Drouët, French Guiana, Martinique, types on February 5, 2016 by bramb.